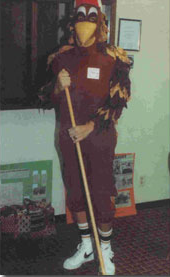 Dusty Roadrunner | Keep New Mexico Beautiful, Inc. 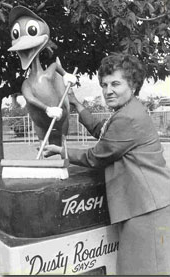 Dusty Roadrunner is the state’s official clean-up mascot, and an icon of the Keep New Mexico Beautiful mission. 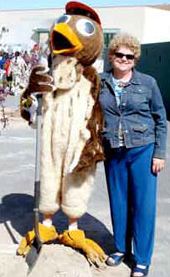 Since his creation in 1964 by Jean Rankin and Mary Olin Harrell, Dusty has made appearances in elementary schools across countless communities in New Mexico. 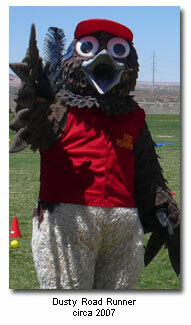 From Reserve to Farmington, Taos to Carlsbad, Dusty is well known as the state litter control mascot. 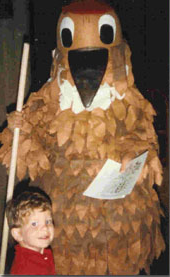 Dusty has touched the lives of many generations of New Mexicans, some of whom remember planting trees with Dusty in the 1960’s and whose children are getting to know Dusty today. 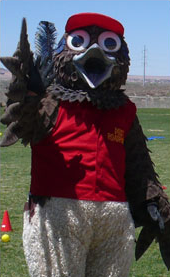 Although Dusty doesn’t officially talk, he has made an impact on New Mexicans and continues to do so by promoting community stewardship through litter-free and beautified landscapes. His message is timeless and is an important part of conserving and protecting our unique Land of Enchantment. 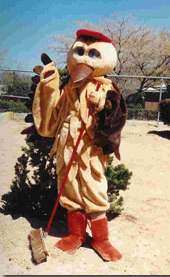 If you would like Dusty Roadrunner to visit your community or school to reinforce the Keep New Mexico Beautiful community stewardship message, please contact info@knmb.org, or call 505-883-5559.